It’s been a while since I’ve posted. Things are progressing, bubbling as they should. But today, I took some time and went through reviewing each of my batches and checking specific gravity where appropriate. Batch #25 (Blueberry Wine) Finally some progress! Still the slowest batch I’ve seen to date, with an SG this afternoon of 1.016. It is still coughing up tiny bubbles on a regular basis. Batch #26 (Blueberry Melomel) The melomel, on the other hand, is down to an SG of 1.005. Which is still pretty high for all the time it has had to ferment. But it, too, is happily bubbling tiny bubbles. Batch #29 (Plum Wine) Since my last post, the plum wine has been clearing, split among a 3G carboy and a 1G jug. I checked their gravities individually, finding the 3G carboy at 0.992, and the other at 0.994. Both could stand some racking, which will probably be done after the new year. Batch #29O (Oaked Plum Wine) With it clearing nicely, but a bit of time until I will act on it, I decided to add oak chips (they are actually small cubes) to the single gallon of plum wine. I used 0.5 ounces of Hungarian Oak. We’ll see how it does. Batch #30 (Belgian Quadruple) The quadruple just bubbles and bubbles. They’re tiny, but there are enough of them to form a sizeable head at all times. With such a stream of carbon dioxide, I decided to skip testing SG. Another time. Batch #31 (Braggot IV) The bubbles continue on this one as well, also forming a head, though much smaller. I skipped testing SG on this as well. Batch #32 (Muscadine Wine) The Muscadine wine is looking good, and has a wonderful “musky” flavor to match its composition. It’s thin for such a dark red wine, but no big deal. No activity, and it continues to clear nicely. SG measured at 0.998. Batch #33 (Hard Cider) While racking the hard cider and the cyser below, I ended up topping up the cider with some of the cyser. Seemed like a better decision than topping with water. Should add the smallest of amounts of additional alcohol to the cider, and a little more spice. Neither of which is a problem, of course. The hard cider still has a couple of drifting bubbles, so is not quite ready for bottling (the SG is 1.000). But it is already a crystal-clear amber. Batch #34 (Fall’s Bounty Cyser) In late November, I racked the cyser, splitting it between a 3G carboy, a one gallon jug, and a 1.5L bottle for the leftovers. Both are clearing nicely. The 3G jug measured an SG of 1.000 this afternoon. Batch #34O (Oaked Cyser) When I racked and separated the cyser above, I added American oak chips (0.5 ounces) to the 1G jug. My wife and I sampled it yesterday, and both agreed it is already it has quite an exceptional flavor. Today, the SG measured in at 1.001. Looking forward to bottling it! Batch #35 (Braggot V) This is a “true” replacement for the “burnt” braggot, which had been a test of an un-hopped braggot. I started it mid-week, and so far so good. It is still in the primary bucket, and bubbling nicely. I’ll probably move it to a carboy early in the week. It makes use of Orange Blossom honey, and came together easily – almost like I knew what I was doing (almost). It started with an SG of 1.082, respectable for something that will likely end up in carbonated ~12oz bottles. Most of the liqueurs are done – the apple, the Asian pear and such. Quite good. Still working on just the right amount of cinnamon so that it is noticeable, but not too strong. Have examples of both the low and high of that spectrum. But with those out of the way, I did start some new liqueurs, which should be ready just in time for Christmas! One is a deep red, made of pomegranate arils and cranberries. Another is brown sugar and cloves, with some added Arkansas Black apples – just enough to add a little apple flavor, hopefully. Another is for Kim; she asked me to try and make one with just brown sugar and cinnamon, not adding any fruit. So I did. And lastly is one I’m prematurely calling “Cranberry Sauce”. It combines key limes, tangerines and cranberries. Not sure how it will turn out, but I hope well. Tomorrow or the next day I have plans to start two things. 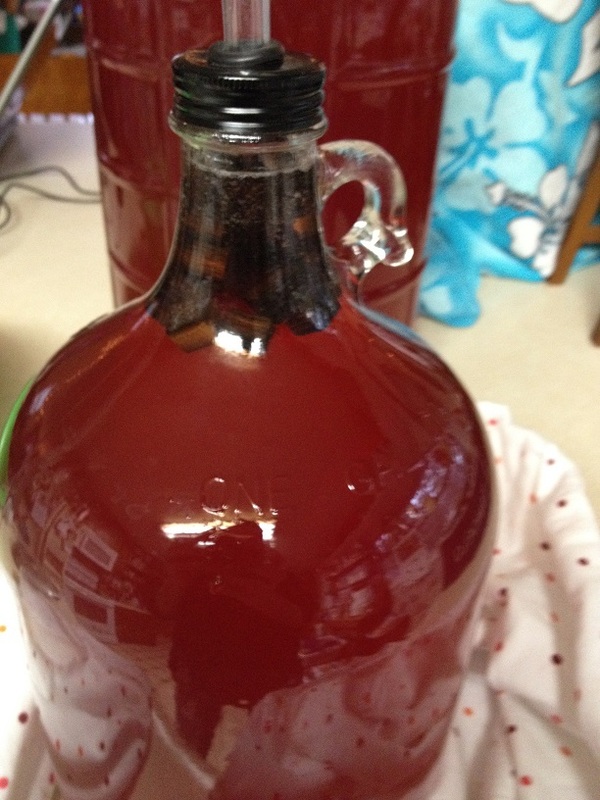 The first is a gallon batch of cranberry wine. ‘Tis the season, I guess. It combines a bunch of sugar, a bunch of cranberries with additional pomegranate, and a hefty dose of raisin, for body. Could have started it this evening, but decided to watch some White Collar on Netflix with my wife. The second is (another!) 5G braggot. But it is not going to be the typical recipe frame I have used. It will have more crystal malt and less pale malt, plus a large (the recipe calls for none, so any is large, I suppose) dose of chocolate malt. And cherries, instead of hops. That’s the plan anyway. I’m guessing it will be darker than my first batch, but lighter than Braggot IV. Probably darker than Braggot V, as well. I’m hoping it shines a blackish-red in the light. I bet it will have much more of a tart punch than any of the previous ones. 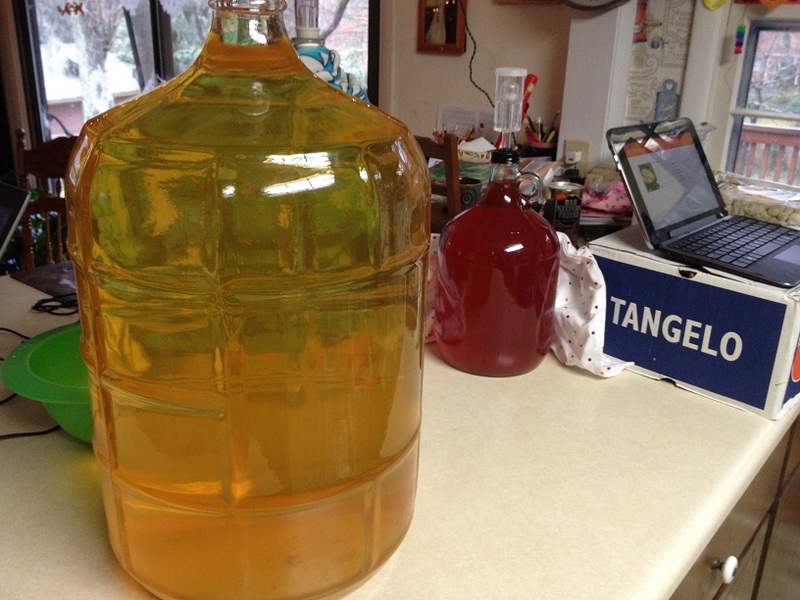 This entry was posted in Fermentation Log and tagged braggot, Cider, cyser, Mead, quadruple, Wine. Bookmark the permalink. 1 Response to Almost Christmas!